A 1903 photograph of family and relatives of Noah Benenhaley (1860-1939) and his wife, Rosa Benenhaley (1857-1937), both descendants of Joseph Benenhaley. Courtesy of the Greg Thompson Collection. Sumter County is located in South Carolina’s midlands, about an hour and a half from the Atlantic coastline in one direction and from the Blue Ridge Mountains in the other. Named after General Thomas Sumter, the “Fighting Gamecock” of Revolutionary War fame, it’s a place like many in the historic Black Belt, the stretch of former slave-holding plantations that extends from Texas to Delaware. Sumter County has also been the traditional home to an intriguing community of dark-skinned people known historically and derisively as “the Turks.” The strange story of this community (who prefer to be called “the Turkish people”) shows how hard it can be to belong in the U.S., even when roots run deep. This obscure community has always traced its history back to an Ottoman refugee who reputedly served the colonial cause in the Revolutionary War. A brief version of their traditional narrative holds that a “Caucasian of Arab descent,” known as Joseph Benenhaley (or Yusef ben Ali, possibly his Ottoman name), made his way from the Old World to South Carolina, where he served as a scout for General Sumter during the American Revolution. The grateful general then gave Benenhaley some land on his plantation to farm and raise a family, the story went. A few outsiders married in; but most who identified with the ostracized community and their progeny considered themselves people of Turkish descent. Amazingly, they persevered as an enclosed society—numbering several hundred persons in the area by the mid-20th century. For many years the Turkish people’s origin story was usually considered no more than myth, a fable concocted to sustain an out-group through unpleasant realities of hard history. In 1973, a historian put it this way: “A stranger visiting Sumter County today may come across a baffling breed called ‘Turks’…. So meager are the facts relating to them that the wildest conjectures, based on what must surely be flight of fancy and geographical ignorance, have been advanced to support their origin.” Still, members of the group persisted in claiming Turkish descent, and now we—a political scientist and a Turkish descendant—have confirmed the group’s traditional narrative and beleaguered history, through original research and oral interviews. The Turkish people didn’t fit cleanly into the broader black versus white paradigm in that part of South Carolina. They adhered to an ancestral understanding that they were “white people,” but outside the Dalzell area, where most lived, they were shunned. Like their black neighbors, they were subject to insults, intimidation, and systemic oppression. The Turkish people had to go to federal court to be able to send their children to “white schools” during the 1950s, and only in the past few decades have they begun to enjoy the full blessings of American life—things like getting good jobs in mainstream society, accessing health care at local hospitals, shopping at community businesses, or participating in Little League baseball, without being turned away or treated as second-class citizens. So who, exactly, were these Turkish people? Were they really an Ottoman Turk’s descendants who had endured as a distinct ethnic community, against long odds, in backwoods South Carolina? 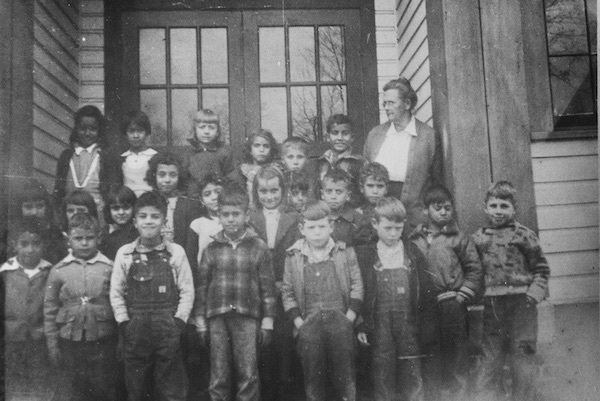 Students and their teacher at the Dalzell School for Turks, probably photographed in the 1930s. Courtesy of the Greg Thompson Collection. The Turkish people have always been extremely skittish about genetic testing, but we obtained DNA sequences for eight direct descendants of the supposed patriarch, Joseph Benenhaley. Though such testing has its problems, it can be useful in combination with other research. In this case, the results for the eight subjects were consistent with ancestry including a Mediterranean/Middle Eastern/North African progenitor, with substantial white European admixture, some evidence of Native American linkages, and no significant sub-Saharan African contribution. We also compiled a genealogical census of 270 Joseph Benenhaley descendants who lived in the Dalzell area during the 1800s, a number we deemed sufficient to judge the social character of that family settlement in its formative generations. The accounting showed important patterns: People with the Benenhaley last name comprised slightly over half (51 percent) of the individuals in the group, and the six intermarried families accounted for almost all of the names in the confined community. This was consistent with the stories we’d heard about a community that has always revolved around the family, their school, their church, their farms, and whatever jobs they could find in the Dalzell area. Finally, we surveyed graveyards at the two churches that served as principal places of worship for the Turkish people during the 1900s; and our count of Benenhaleys buried in both was equally impressive. Benenhaleys again comprised a slight majority (51 percent) of interred individuals, and the same six family surnames accounted for virtually all of the individuals resting in peace in those cemeteries. Also, few individuals with Turkish-community names were buried outside the Dalzell area, attesting to the isolation of that group. All these findings, and others, suggest very strongly that the Turkish people did indeed endure as an enclosed ethnic community—originating from Joseph Benenhaley and known as “the Turks”—in rural South Carolina for almost two centuries. Getting Turkish elders to talk about themselves was a difficult task—bad memories still bothered many of them. As one scholar reported in the 1970s, “The mood of the community strictly opposes any sort of historical investigation. The people will tell any would-be historian that they don’t know anything, don’t think that anyone else does either, don’t see any point in it, and think that he should go talk to some other member of the community.” However, four brave souls—“Boaz,” “Helen,” “Jean,” and “Tonie” (all adopting pseudonyms because feelings still run high in this area)—talked to us about their personal lives and community experience. For many years the Turkish people’s origin story was usually considered no more than myth, a fable concocted to sustain an out-group through unpleasant realities of hard history. Tonie remembered having to stay out of school for a year during the integration movement. “It was awful,” she said. “You never knew what they were going to say to you or what they were going to do to you. Even the teachers were prejudiced. Traumatic. Kids calling you ‘Turk.’ If they were the only ones on a seat, they would put their books on the other side of the bus so that you couldn’t sit there, and dare you to move them.” Helen told a story about a white hair stylist who wouldn’t cut a dark Turkish teenager’s hair. Jean described a traumatic Ku Klux Klan rampage during which somebody burned a cross on her father’s yard. “We were afraid to go outside the house,” she recalled. When asked about their relations with black people, the Turkish elders had little to say and spoke nothing negative. They would compare the ways whites treated them to the ways whites treated blacks. Apparently, the two minority populations had always harbored resentment against the white establishment, and this served to mute whatever grievances they had against each other. Today’s Turkish people are not as closed off as in the past—life is better in the 21st century. Most now marry outsiders. Many have moved to other areas, either to start a family or to attend college and begin careers. Those who have stayed say that, generally, they are “treated right” in Sumter County. The strange story of the Turkish people is important, not only for the belated recognition and dignity of that community but also as a compelling addition to our understanding of the American experience. The persistence of Joseph Benenhaley’s descendants—and the experiences of people like Boaz, Helen, Jean, and Tonie—illustrate that for some people, becoming American is a long and difficult ordeal. Glen Browder and Terri Ann Ognibene are, respectively, a former member of the U.S. House of Representatives from Alabama and professor emeritus of political science and American democracy at Jacksonville State University in Alabama; and a Spanish teacher at Pope High School in Marietta, Georgia. They are co-authors of South Carolina’s Turkish People: A History and Ethnology.